There’s a mysterious killer on the loose in Pennsylvania’s orchards. This predator also has wreaked havoc in New York, North Carolina, and Ontario, Canada — as well as some of the surrounding areas — and seemingly strikes at random. The victims? Young, dwarf apple trees that appear healthy until one day, they simply aren’t. 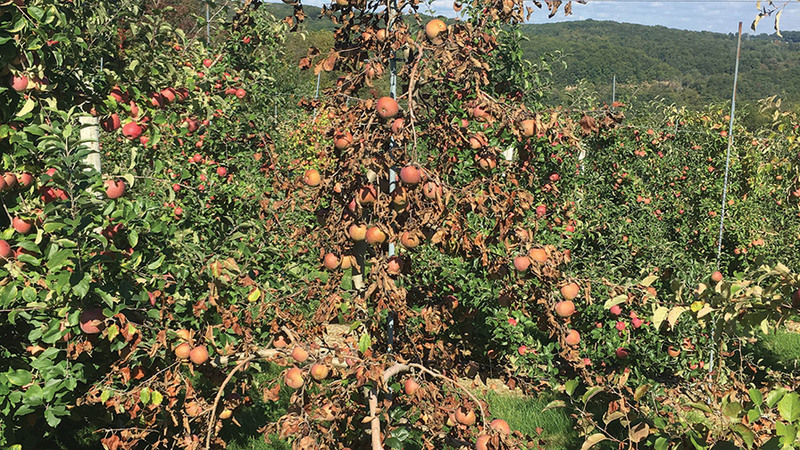 Scientists, researchers, and plant pathologists have given the problem two names: sudden apple decline (SAD) or rapid apple decline (RAD), depending on how long the tree lives from the first exhibited symptoms until total collapse. Growers often have little time to act. 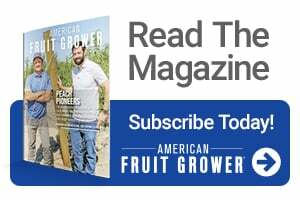 “In many cases, trees will be healthy at harvest, with a full crop, only to suddenly collapse and die a few weeks later,” writes Penn State Fruit Research and Extension Center’s Kari Peter, Ph.D., in her final report to the 2017 State Horticultural Society of Pennsylvania (SHAP) Extension Committee. “Many growers have been hit especially hard by this issue only to be left with the option of removing all affected acreage,” Peter says. Despite the severity of the issue, the underlying cause remains largely unknown. There are many reasons for this. The first is that SAD/RAD may have contributing factors. The problem is devilish because it at first appears to have many causes, and researchers believe that the apple tree decline is often misattributed to issues like fire blight, Phytophthora infection, or black stem borers. In some cases, the secondary problems seem to develop after the tree is already in decline, contributing to a swift demise. Another problem is that apple trees are woody hosts, and woody hosts are notoriously difficult to diagnose. Peter says the way the virus presents in woody hosts often depends on how aggressive the virus is in building up particles in the plant. This can be especially frustrating when researchers go to test a theory. One prevailing idea is that SAD/RAD may be caused by apple luteovirus 1. That’s where a bigger problem comes into play: research dollars. Trying to get funding to test theories for a semi-mysterious apple tree murderer before having any tangible data to present to the institutions responsible for doling out grant money is as frustrating as it sounds. 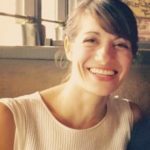 Researchers need resources to dedicate to the project, and organizations need data to prove they aren’t throwing money on wild theories. While everyone tries to navigate this chicken-versus-egg issue, more trees decline and die. While a ragtag team of scientists have mostly pursued answers to the SAD/RAD issue as a side project, some small grants have helped along the way. Funding from the New York State Apple Research and Development Program (ARDP), for example, helped members of Cornell University’s Eastern New York Commercial Horticulture Program and Lake Ontario Fruit Team develop a survey that was released to growers in the summer of 2017. In an article written about SAD by Cornell’s Tess Grasswitz and Kerik Cox, the survey and field observations help identify the varieties affected and note that affected trees in a block are random until the decline progresses and there doesn’t seem to be an “edge effect” in the blocks. The survey also left a lot of unanswered questions. “It is possible that sudden apple decline may be similar to honey bee colony collapse disorder, in that it may be the result of a complex combination of stressors rather than a single causative agent,” Grasswitz and Cox write. Peter’s funding from SHAP in 2017 also went toward a grower survey that left more questions than answers, particularly about apple luteovirus 1. The report Peter wrote for SHAP indicates that of the 380 samples collected from suspicious trees, 80 samples from seven orchards in four counties tested positive for the virus. This may seem like a relatively low percentage, but researchers were intrigued. “Through additional experiments, we have found that the virus is not evenly distributed within the tree, such that different areas of the tree may be positive or negative for the virus. Consequently, we may have trees testing negative that could be positive,” Peter wrote. “We are in the process of seeking additional funding to optimize our diagnostic protocol, to shed light on the virus transmissibility, determining if this virus has been introduced or is endemic, as well as figuring out if this is another latent virus that is guilty by association. The take-home message to date: We cannot connect apple luteovirus 1 infection to RAD, but we are aggressively trying to understand what connection, if any, this virus has to influencing RAD,” Peter continued. That’s about where things are today. While the USDA grant money researchers applied for didn’t come through, Peter secured another small grant from SHAP this year. 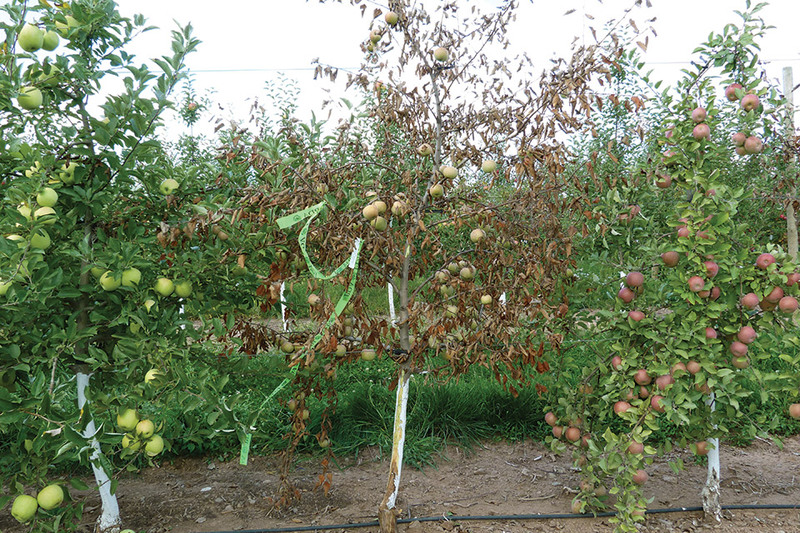 With the funds from the grant, a small group is working with Adams County Nursery on an experiment that Peter hopes will show a connection between the apple luteovirus 1 pathogen and SAD symptoms. 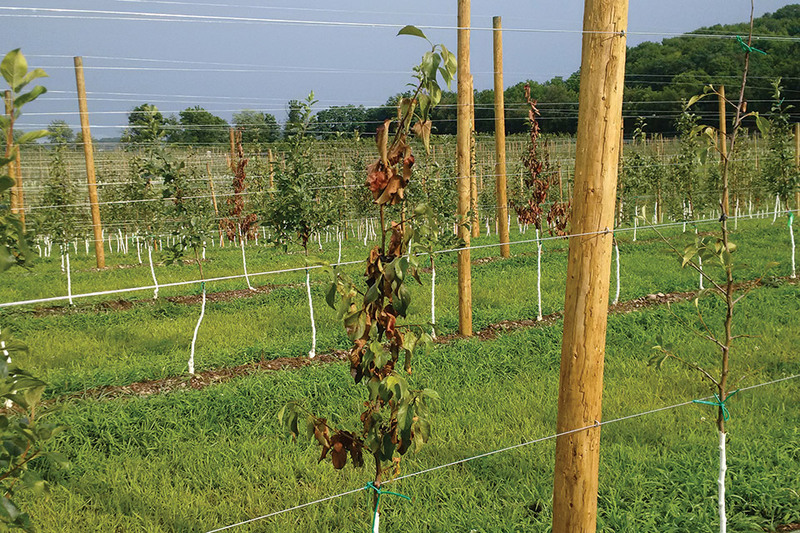 The nursery grafted 200 ‘Fuji’ and ‘Golden Delicious’ apple trees with infected bud wood from a tree with apple luteovirus 1. The researchers won’t get the trees until next year, which means it will take even longer to see whether the virus causes SAD/RAD symptoms. Still, it’s a step in the right direction. In the meantime, growers can take steps to minimize their risk. The most important things are to limit tree stress and upgrade crop protection practices, defending trees from wood-borne insects and diseases, weeds, and rodents. Peter also recommends growers invest in high-quality and high-caliber trees. A block can have a mix of dead, declining, and healthy trees dispersed fairly evenly throughout. Young, dwarf trees (2-8 years) are most susceptible. To date, semi-dwarf rootstocks have not been associated with this issue. Of the multiple varieties and rootstocks impacted, M.9 is most affected. 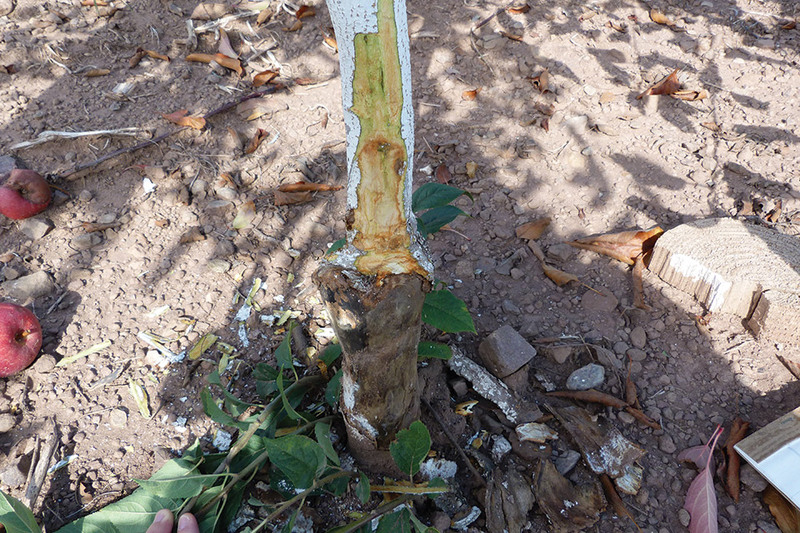 The graft union is affected: severe shedding of bark around graft union and cankers is present. Necrosis begins at the graft union and proceeds up the tree’s trunk. Affected wood usually is solid and not spongy. The rootstock is healthy, as indicated by many rootstock suckers present and a healthy root system. The leaves on the trees begin to look pale yellow, then reddish (indicating tree girdling). Within two weeks, the tree can be dead. Total tree collapse has been observed from late July through September. Note: This was excerpted from Penn State University Extension information.